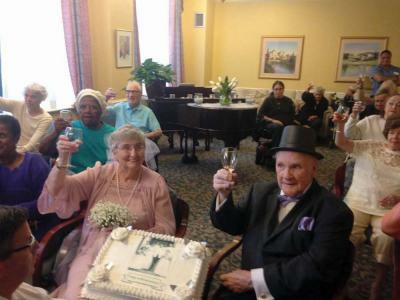 It was 60 years ago this month, on July 30, 1955, that Fred and Anne Blesedell exchanged their wedding vows, and late last month, they renewed their promises to each other in a celebration at Standish Village, an assisted living community in Dorchester that the couple now calls home. Fred, 89, an Uphams Corner native, and Anne, 85, who grew up in Roxbury, met at the Boston City Hospital laundry in 1952. Their first date the following year still remains somewhat of a joke between the two of them. “When you go out on a date with a woman, where do you take them on their first date? Well, I surprised her, since I’m thinking she’s either going to throw me over or take me, so I took her to see “The House of Wax,” Fred said. His choice to take her to the Vincent Price horror film did indeed come as a surprise to Anne. “That was our first date. He said he was going to take me to a concert, but then he told me we were going to see “The House of Wax.” I should have started running away then and there,” she said. But she didn’t, and two years later they were married. After living with Fred’s mother in his childhood home while his father was in the hospital with cancer, the couple moved to Hull in 1957, where they stayed in the same house for the next 58 years before moving to Standish Village a little over a month ago. Fred worked as a sanitation and construction inspector for the city of Boston for 37 years before retiring and going to work at Stop and Shop for 19 years. Anne, meanwhile, ran the house and cared for their two daughters, Kathleen and Deborah, who now have four grown sons between them. Kathleen was the flower girl at her parents’ renewal ceremony on June 29. For her, their marriage, despite its impressive duration, is the same as most others. “We’re just an average husband and wife, I guess.” For Fred, looking back on the past 60 years, he can’t imagine wanting anything else than what he has. “We’ve had a good life. We’ve had the usual husband and wife things going,” he said.